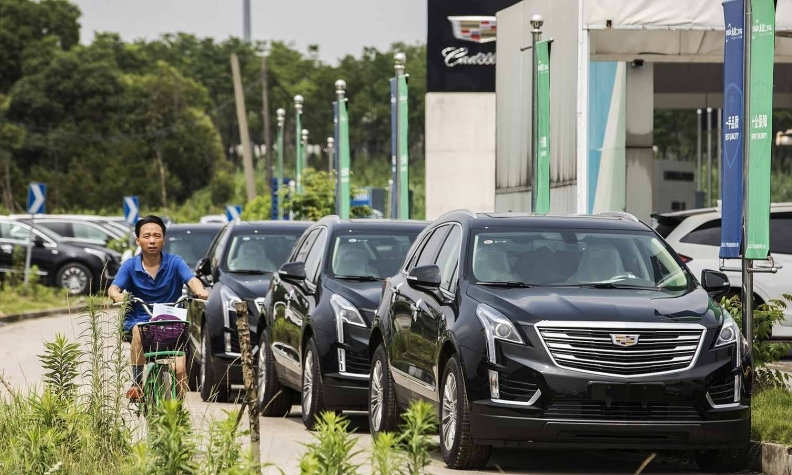 A Cadillac dealership in Shanghai on July 8, 2018. GM's sales in China declined 15 percent to 835,934 in the third quarter but Cadillac sales were strong. DETROIT -- Stronger-than-expected results in China and North America propelled General Motors to a 25 percent increase in pretax profit in the third quarter and net income of $2.5 billion. Revenue increased 6.4 percent to $35.8 billion during the period. The company said third-quarter global profit margins reached 8.8 percent, including 10.2 percent in North America. The third-quarter results compare with a loss of almost $3 billion a year ago, due to the sale of GM's Opel/Vauxhall European operations. GM's pretax profit increased $630 million from a year earlier to $3.2 billion. GM CFO Dhivya Suryadevara called the results an “outstanding quarter” with “strong execution” despite growing headwinds such as slowing sales in North America and China -- GM’s key markets. The results significantly beat Wall Street's estimates and have the automaker bullish on achieving, if not exceeding, the top range of its guidance for 2018. GM said it expects to end 2018 with 9 to 10 percent North American profit margins, free cash flow of $4 billion and earnings of about $6 a share. Despite lower sales in the U.S. and China, GM was able to record strong results in both regions with a mix of higher priced vehicles and pricing power. North American profits of $2.8 billion, up $700 million from a year ago, were driven by sales of GM’s crossovers and pickups, including the redesigned 2019 Chevrolet Silverado and GMC Sierra. GM, according to Suryadevara, delivered 45,000 of the next-gen pickups, known as T1s, in the third quarter. For the year, the company plans to deliver 120,000. With upcoming launches of GM’s heavy-duty pickups and next-generation full-size SUVs, Suryadevara said the company believes it can continue to benefit from strong pricing and prudent incentive spending in North America. GM sold 834,000 vehicles in North America in the third quarter, down from 925,000 a year ago. In the U.S., sales dropped 11 percent to 694,638 during the quarter. In China, Suryadevara attributed the company’s record third-quarter income of $500 million to new and redesigned products -- particularly in the luxury segment, which has been less susceptible to slowing sales in the country. GM’s sales in China declined 15 percent to 835,934 in the third quarter. Regions: North American earnings increased 37 percent to $2.8 billion, up from $2.1 billion a year earlier. Earnings for the company's international operations declined to $139 million from $389 million a year earlier, but China achieved a record third-quarter equity income of $485 million. Finance: GM Financial reported earnings of $498 million from continuing operations, up from $310 million a year earlier. Expectations: GM beat Wall Street's expectations for a 14th consecutive quarter. The company reported earnings of $1.87 a share, above analysts' forecasts of $1.25. GM Cruise: The company's autonomous vehicle operations had a net loss of $214 million in the third quarter. For the year, the company has invested $534 million into the operations. It plans to invest about $1 billion into GM Cruise in 2018. GM shares were up 7.3 percent to $35.97 as of 8:30 a.m. ET in premarket trading. GM on Tuesday declared a fourth-quarter dividend of 38 cents a common share.